Research on wireless sensor networks (WSNs) has mainly been focused on protocols and architectures for applications in which network performance assurances are not considered essential, such as agriculture and environmental monitoring. However, for many important areas, such as plant automation and health monitoring, performance assurances are crucial, especially for metrics such as delay and reliability. The GISNENG project plans a significant advance beyond the state-of-the-art by developing a novel performance controlled WSN that is targeted for use in a range of industrial environments. In such environments, WSN technology should result in significant savings in deployment and maintenance costs, and offers easy reconfiguration and rapid deployment in adapting to changing business needs. The overall goal of GINSENG is a wireless sensor network that will meet application-specific performance targets, and that will be proven in a real industry setting where performance is critical. The GINSENG goal requires several innovations and a fresh approach to wireless sensor network research. Firstly, GINSENG adopts a planned approach for sensor node deployment as a basis to enable performance control. The second basis of GINSENG is software components with assured performance, including operating systems and protocols for radio medium access. The third basis of GINSENG is a set of algorithms that ensure control with respect to network topology and traffic. These three components enable the possibility to deploy sensor networks with assured performance. Recognising the inherent uncertainties of the real-world, GINSENG will also provide mechanisms and tools to perform performance debugging of deployed systems. To encourage exploitation of the research outputs, GINSENG will integrate with industry IT systems, a proposition strengthened by the participation of SAP as a partner. 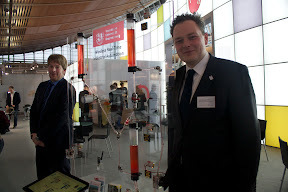 The applicability of the technology developed in GINSENG will be proven by developing a wireless sensor network for a real-world application where performance is critical – in the context of an oil refinery run by GINSENG partner Petrogal, where it will be used to monitor and control industrial processes, safety and pollution. 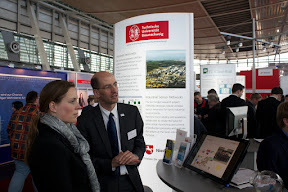 CeBIT 2012. 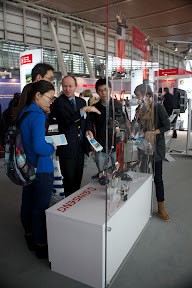 From 06th to 10th of march 2012GINSENG was presented at CeBIT in Hannover. A custom built demonstrator illustrates GINSENG's real-time wirelss industrial automation approach: A total of 7 INGA-Sensor Nodes form a time critical wireless sensor network and connect to a sink which again is connected to the GINSENG middleware. We had more than 500 technical discussions at our booth, exchanged many contact cards and met many interested und intersting people. 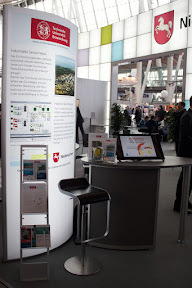 Take a look a the whole CeBIT 2012 album or at the Video-Podcast (in German). An overview of GINSENG's outcome and a short description of all partners on a flyer. if you are interested in writing a thesis regarding this project, please feel free to contact Dr. Oliver Wellnitz or Dr. Felix Büsching.